The ET-MWP100G Multi Window Processor makes it possible to quickly and efficiently combine multiple LCD displays and projectors into a video wall or a multi vision system. Dedicated "Control Software for Multi Window Processor" supplied. Single or multiple output layouts and multiple canvases. Simultaneous use of multiple layouts and canvases. One or more windows (PinPs) on each canvas with 360° rotation of each window. Edge Blending function for projectors. Bezel area adjustment capable for flat panel displays. 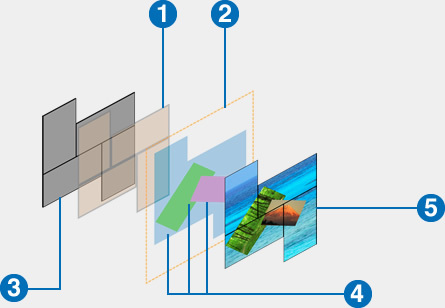 A single image can be presented across multiple displays. Window layers can also be displayed. Flat displays with different screen sizes can be set as a single "canvas," and the image can be displayed at the same scale throughout. Defines how each output is used. Outputs can be grouped together or used individually, and can be independently rotated through 360° in real-time, without adding additional delay, for use in creative video wall applications. Multiple layouts can be used at the same time or one layout can be designed to tie multiple projectors or monitors together as one large image. Up to 4 layouts can be used simultaneously. Designates how input images are output to displays or screens. Multiple canvases can be used at the same time to define multiple layouts to aid in choreographing a video design. Up to 4 canvases can be stored to memory and recalled anytime during operation, which enables dynamic and impressive visual design. From simple rectangles to complex formations, display units or screens can be configured into a variety of combinations. 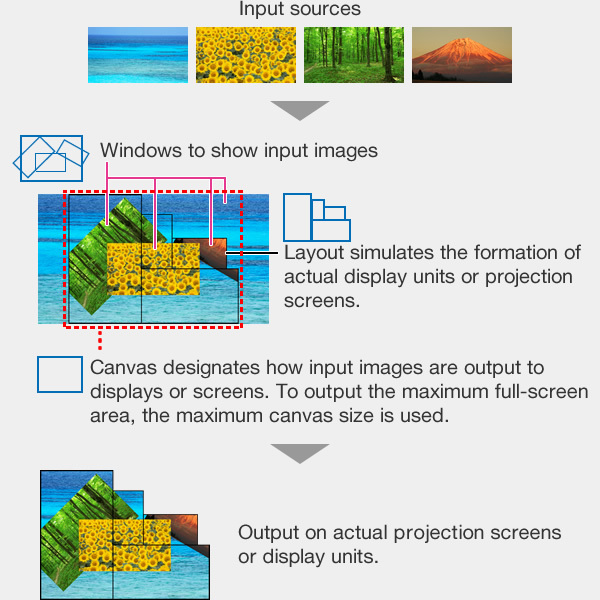 Up to 14 windows can be placed in one canvas with the capability to resize and rotate each window 360° on the canvas. The order in which windows overlap can also be set. Images are displayed in the set windows. Capable of up to 28 inputs with the ET-MCYDV100 DVI-U and ET-MCYSD200 3G-SDI boards. Capable of up to 56 inputs with the ET-MCYSD210 HD-SDI board. Capable of up to 28 outputs with the ET-MCQDV150 DVI-U board. Capable of up to 28 outputs with the ET-MCQDL350 DIGITAL LINK board. DIGITAL LINK is an original function added to HDBaseT™ technology allowing transmission of HDMI, uncompressed HD digital video, audio and control signals (Ethernet, RS-232C) for up to 100 meters (328 feet) through a single CAT5e (STP) cable or higher. see the list of tested equipment compatible with DIGITAL LINK. * Ask a qualified technician or your dealer when installing or removing this product. ** HDBaseT™ is a trademark of the HDBaseT Alliance. Low power consumption of max 160 W* with 16 interface boards mounted. An optional power supply unit ET-RPS100G for dual power supply which can prevent power disconnection. * When using a single power supply unit. 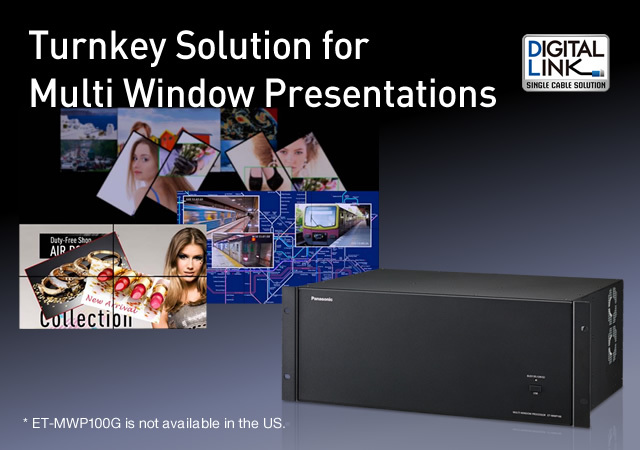 Incorporating the ET-MWP100G into this system allows a variety of content to be displayed with a highly flexible layout. It brings powerful impact and appeal to digital signage. The low power consumption of the ET-MWP100G helps to reduce the total cost of ownership (TCO). Reliability is also increased by mounting the optional ET-RPS100G power supply unit as a power backup. Combining this with the Panasonic projector and the video wall display for 24/7 operation is recommended for surveillance or observation use where high reliability is demanded. 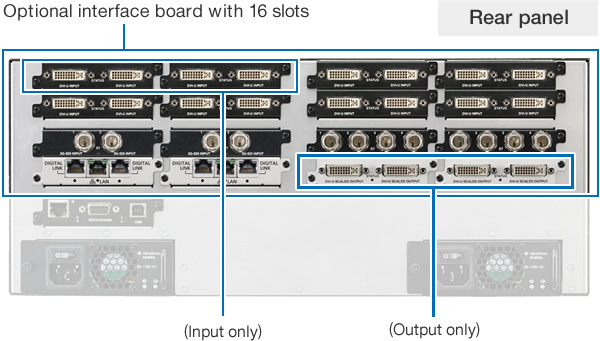 * Required to connect each output terminal of the ET-MWP100G with each projector or flat panel display. Up to 28 projectors can be simultaneously output via DIGITAL LINK when the ET-MCQDL350 DIGITAL LINK board mounted. This illustration is intended only to show display patterns. These patterns cannot all be simultaneously output.